This magical garden scene inspired me for the ending of my newest story, and whenever I gaze at it, even for a few seconds, I instantly hear the first sounds of Claude Debussy’s “Sonata for Flute, Viola and Harp” (1915). 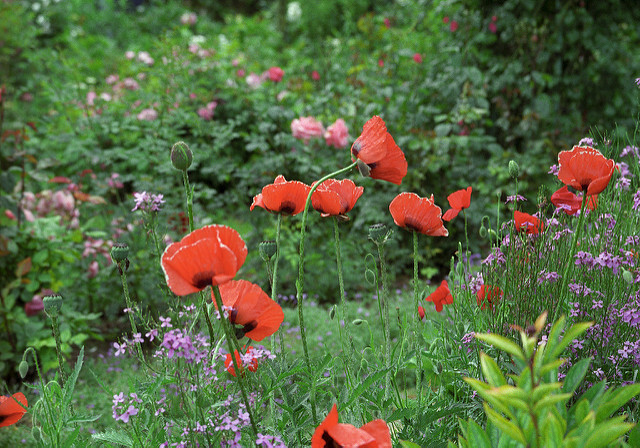 At once I am transported into the realm of dreams, I am threading the paths of a garden in bloom, stepping through the soft grass and hearing the distant mingled murmurs of many flowers. Sweet fragrance of the lilac tree hangs in the air like a cloud. 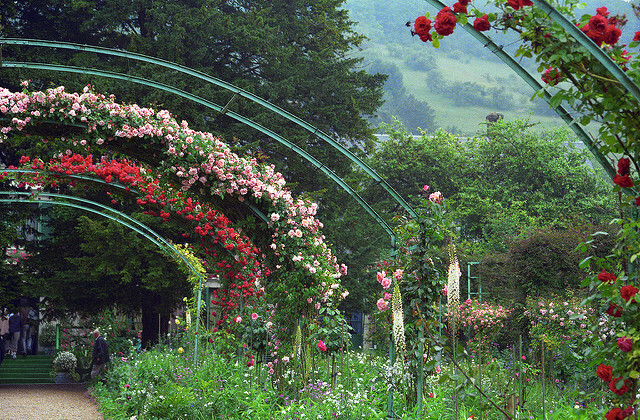 In a dream, the flowers speak in a language I can understand. The tales they tale, I dare not repeat. 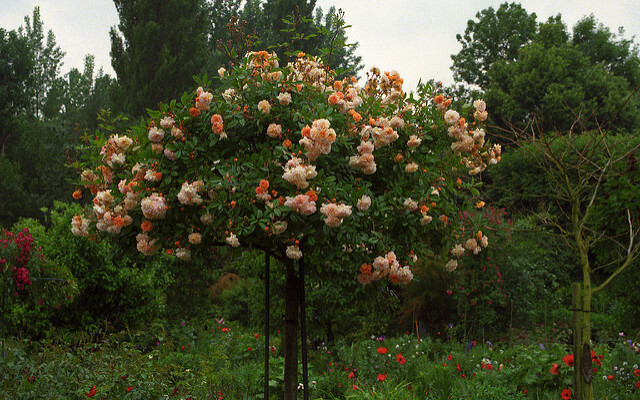 I am only in this magical garden as long as the music lasts, I can only observe but never truly belong; listen but not speak, see but not be seen. 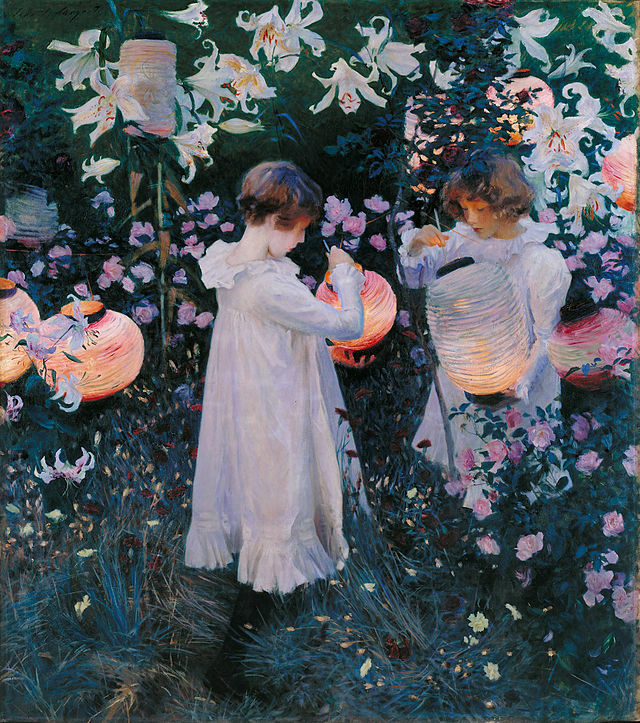 The girl in white in the painting is Lili, Butler’s daughter, seventeen years old at the time. but Lili is trapped there forever, and she doesn’t mind it at all. The roses told me so. Lili lives in a dream and all the flowers bloom just for her. In the sea of intense greenness, woven with white, painted all in short quick brushstrokes and dots, the whiteness of her figure stands out. I love the curvy, S-silhouette of her body against the green background. She seems to be picking a flowers, roses perhaps. Her hair is brown, but if you take a better look, you’ll notice it’s painted in a really deep nocturnal blue, which also appears in the grass growing around her feet. 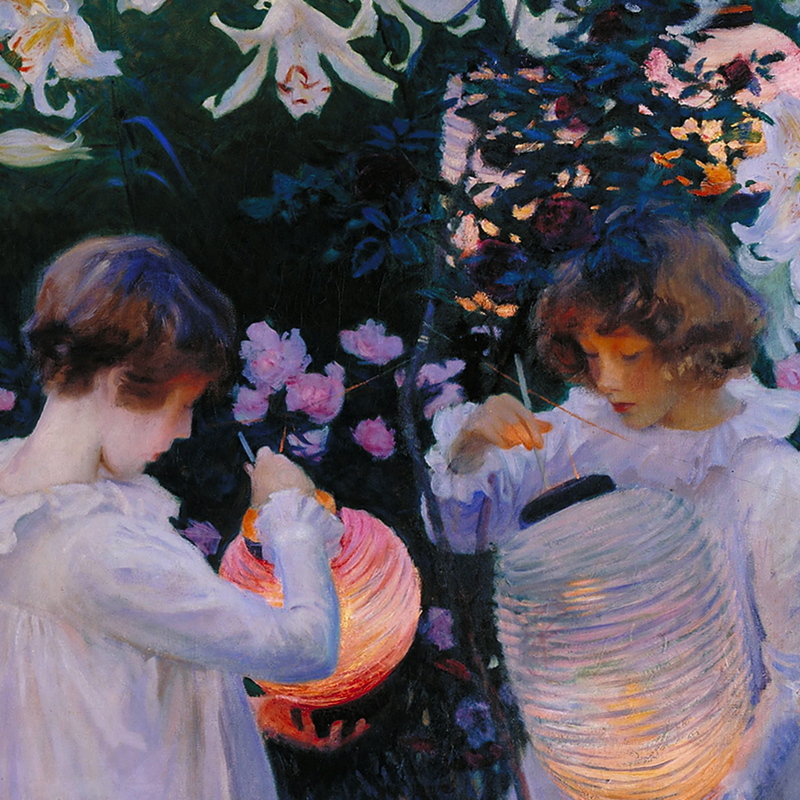 The dreamy, magical mood of this garden scene reminds me of John Singer Sargent’s painting “Carnation, Lily, Lily, Rose”. Everything is so mysterious and lively in Lili’s dream garden. Every little detail here, every blade of grass and every flower look like they are flickering and bursting with excitement. Turn around Lili, so I may see your face! Oh, please! Let me come closer so I can see your pretty white dress. I saw your white hair ribbon, do you know? 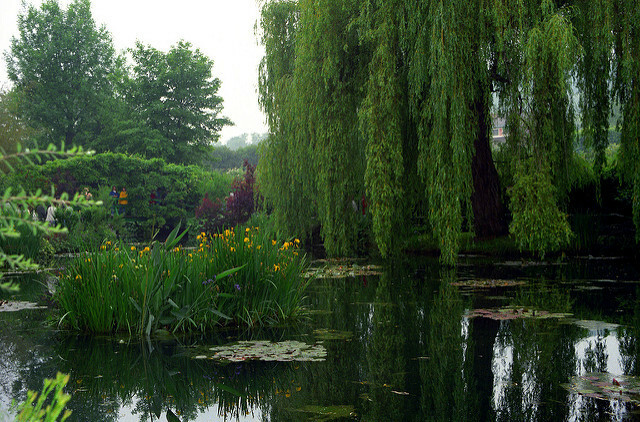 It fell on a lotus flower in the pond, it must have been when you were crossing the bridge down by the weeping willow tree. Lili? Lili! …. Oh, I am afraid I cannot tell you more, for the music is fading and with it the garden’s magic is slowly disappearing for me. 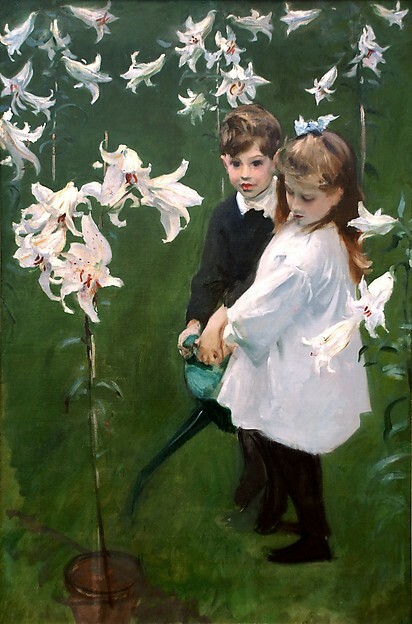 The greenness takes on paler shades, Lili’s figure is blurrier and I don’t feel the soft grass under my feet anymore. Flute is in the air no more, the harp’s strings are silent too… In the last seconds, Lili turned around and said that I cannot stay there because it is her magical garden, and I must find my own. And again I am in my room, the air is stale and heavy from memories, but infused with sweet scent of hopes. The afternoon is rainy and the skies are dark and low. 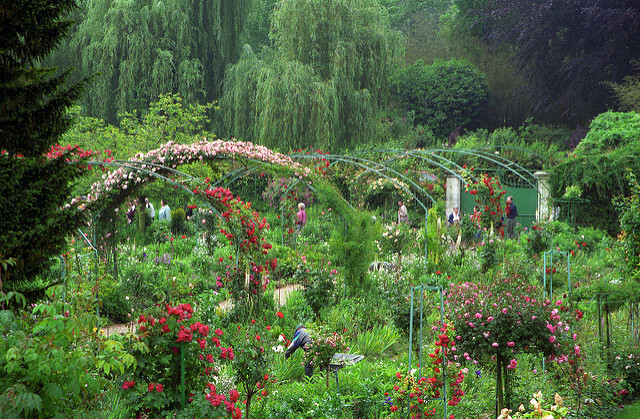 Monet’s garden, Giverny, France by Rick Ligthelm. 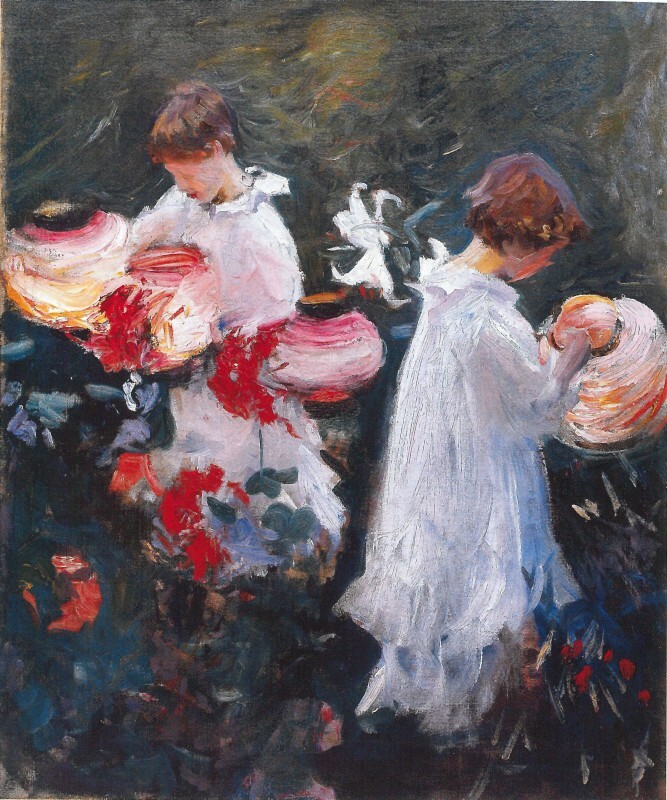 Butler was an American painter who first studied in New York City at a progressive art school Art Students League, and then, in 1885, like many American artists, he came to Europe, Paris to be more precise: the place to be for an artist. 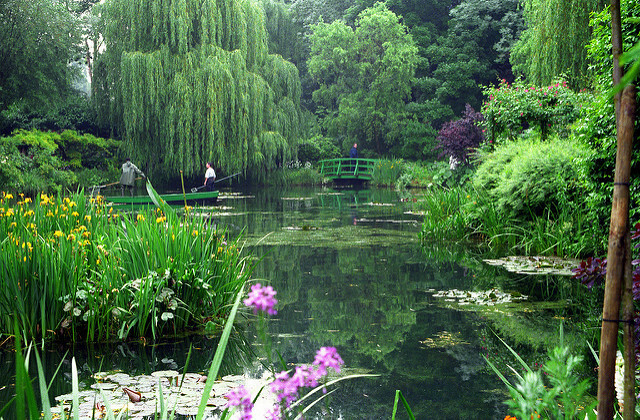 In 1888 he was fortunate enough to meet Claude Monet in his famous splendid gardens in Giverny. Meeting Monet changed two things in Butler’s life; firstly, he started painting garden scenes, or outdoor scenes, with lose brushstrokes and vibrant colour, and secondly, he met and married Suzanne Hoschedé in 1892, one of Monet’s stepdaughters and his favourite model who posed for the lovely painting “The Girl with the Parasol”. The couple had two children; Jimmy, born in 1893, and Lili, born in 1894, but sadly Suzanne died in 1899. Butler travelled to New York City to cure his sad heart, and six months later, in 1900, he married Suzanne’s younger sister Marthe who helped take care of his children. 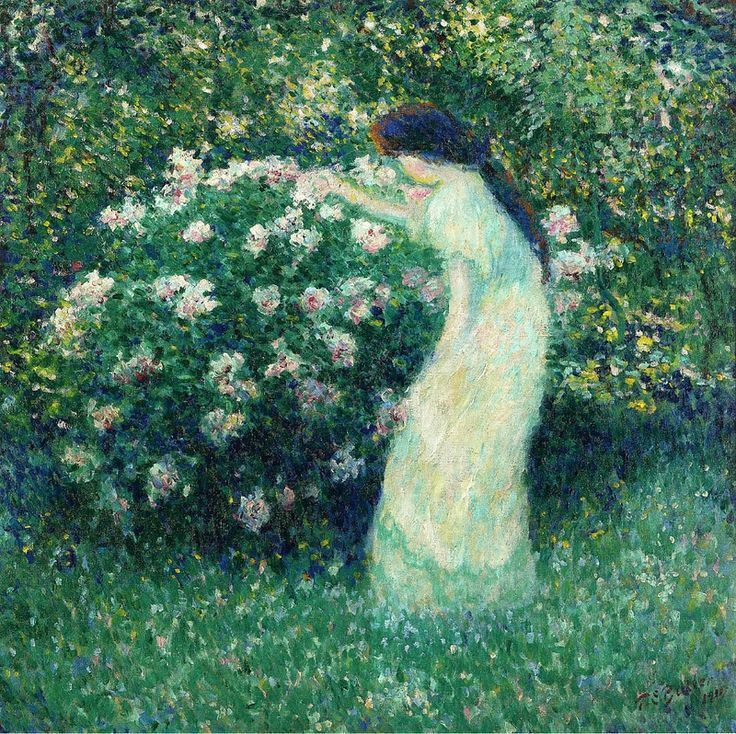 Although initially inspired by Monet, Butler developed his own style which is just a continuation of Impressionism. Flatness and vibrant colours are more similar to the works of Vuillard and Bonnet. In his portraits of trees and flowers, Klimt conveyed a sense of lyricism and mystery that nature possesses in abundance, but holds it secret to most, choosing rather to reveal her charms to the eye capable of recognising her Beauty. These four damsels on the meadow in Klimt’s painting are so beautiful and so silent. Never eager for a conversation, they hesitate to speak to me, but they are not proud, but shy, or so the swallows have told me. And how white their gowns are, how fragile their frames; eastern breeze carrying the sound of a distant flute might blow them away! What mythical land have these enchantresses escaped from, I wonder. The gentle grass is swaying on the melody of Debussy and little blue flowers are batting their eyelashes vivaciously, all that is alive and breathes is awaken at the arrival of the mischievous Faun. Oh, yes, the Faun must wander these paths for sure. The birches’ entire bodies tremble, the little green leaves sigh, as they hear the Faun approaching, for they know that, once again, his flute playing will send them into the wildest dream. Dewdrops on the grass are trembling as the sun starts shining slowly and shyly through the woods announcing the day. The birds awaken as the dawn gives birth to morning; fresh, green and glorious. In a step or two, the wild Faun leaves, biding farewell to the birches as they descend into sweet dreams. Tired from their dancing in the dawn, they enjoy indolence during the day, and so a wandered through the woods might assume that they are serious by nature. In other days it was not so. And the Dawn found and prisoned me! And evermore — I dance! I dance! 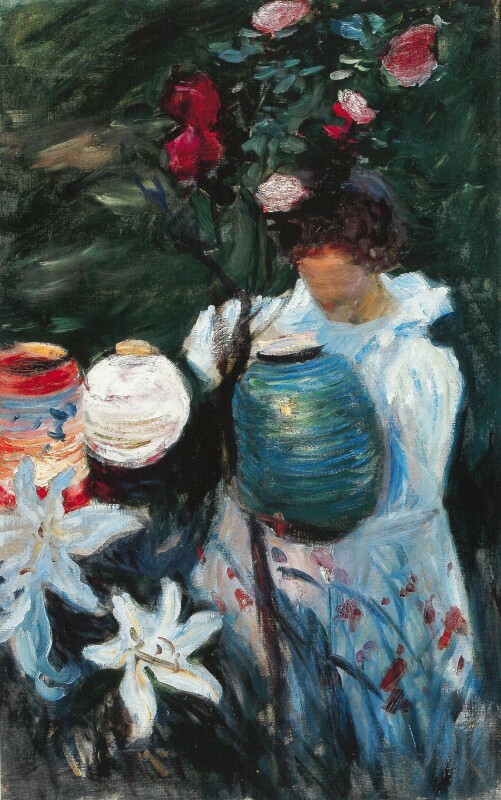 In Vienna, Klimt’s artistic focus was on humans as he diligently painted lavish nudes and portraits for rich aristocrats, but in summer months spent in Litzlberg at Lake Attersee he gave himself to nature and painted rich orchards with apple trees, farm houses and chickens, plain and pretty garden flowers, and trees. On his holiday, Klimt would arise early in the morning, around 6 o’clock, and indulge in long walks through the meadows and nearby woods. 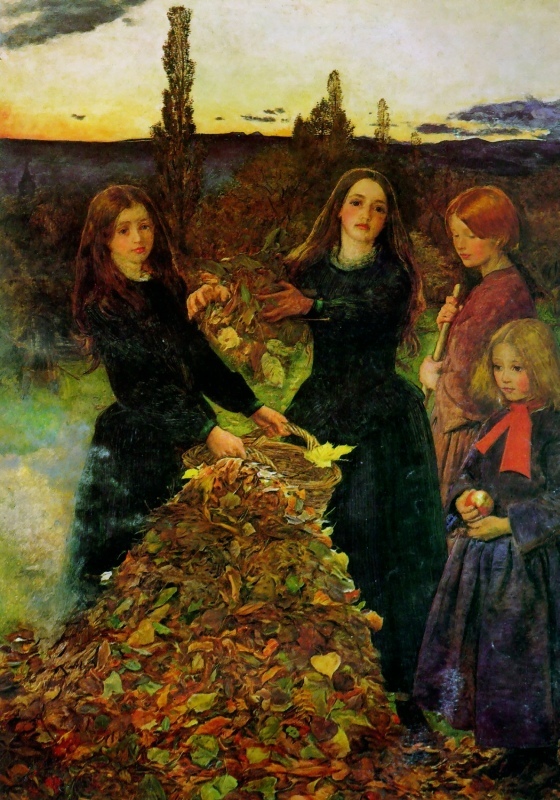 Were the nymphs the ones to lure him, or was it the smell of wild flowers? So, just like Faun, Klimt tastes the sweetness and secrets of nature at dawn, and these moments became a part of his art. The locals there called him “Waldschrat”: “someone who lives in the woods on his own”. It seems that Klimt and I share the same idea of indolence; for me it isn’t about doing nothing, it’s to stop and ponder, gaze and breathe. 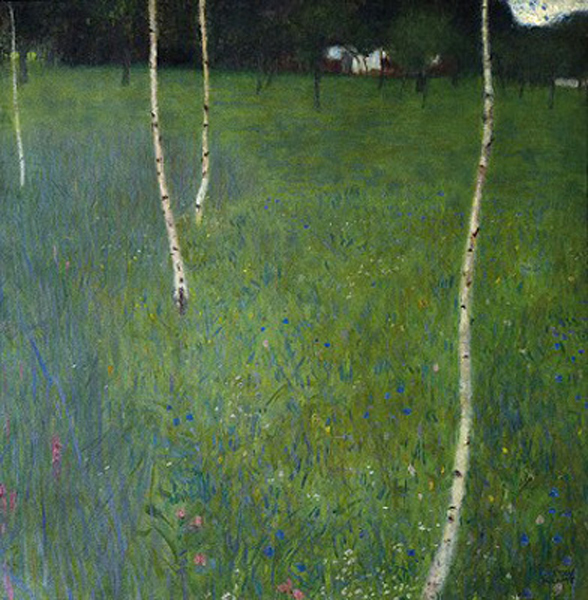 In “Farm House with Birch Trees” Klimt created a sense of depth; the meadow seems to stretch endlessly upwards, the birches are not painted with their tree tops and leaves but left as slim white lines, slightly crooked, and creating a rhythm in the way they are placed in a diagonal line, surrounded with different layers of flowers, reminiscent of some of Hiroshige’s plum orchards. Klimt is meticulously focused on details and his landscapes have little in common with the sketch-like laid-back styles of Monet. At the same time this painting seems to me like a moment frozen in time, still and ornamental, flickering with details and colours; and at the same time it is a portal to the world of dreams, a world where the Faun, nymphs and flowers await you to join their celebration of indolence and taste the never ending flow of honey, music and laughter. Oh, how I wish to go there! Wait, I can hear the music, how it lures me: Debussy’s “Prelude to the Afternoon of a Faun“.